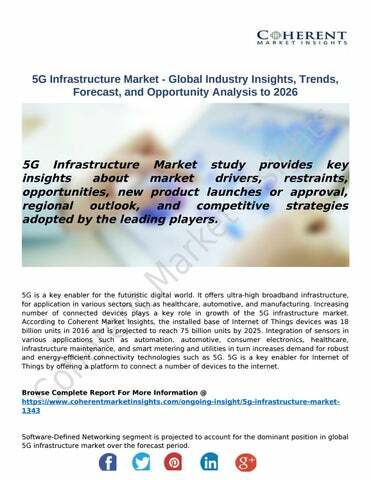 5G Infrastructure Market study provides key insights about market drivers, restraints, opportunities, new product launches or approval, regional outlook, and competitive strategies adopted by the leading players. 5G is a key enabler for the futuristic digital world. It ofers ultra-high broadband infrastructure, for application in various sectors such as healthcare, automotive, and manufacturing. Increasing number of connected devices plays a key role in growth of the 5G infrastructure market. According to Coherent Market Insights, the installed base of Internet of Things devices was 18 billion units in 2016 and is projected to reach 75 billion units by 2025. Integration of sensors in various applications such as automation, automotive, consumer electronics, healthcare, infrastructure maintenance, and smart metering and utilities in turn increases demand for robust and energy-efcient connectivity technologies such as 5G. 5G is a key enabler for Internet of Things by ofering a platform to connect a number of devices to the internet. Software-Defined Networking segment is projected to account for the dominant position in global 5G infrastructure market over the forecast period. 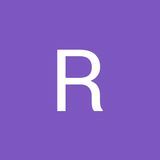 Software defined network segment accounted for a dominant position in the 5G infrastructure market and is expected to retain its dominance throughout the forecast period. Software defined network is known as intelligent network architecture, planned to minimize hardware constraints. 5G allows for various advance features high speed connectivity, large bandwidth etc. Providing 5G features through conventional networks becomes difcult as it does not support all the features. Therefore, it is not possible to provide efective control and network management in conventional networking. Hence, software defined networking is the only solution for controlling complex 5G networking. North America held a dominant position in the global 5G Infrastructure market in 2020. North America hold a dominant position in the market in 2020 and is projected to retain its dominance throughout the forecast period. The U.S. and Canada are the major growth engines in the region. Government initiatives to improve the current infrastructure, is expected to aid in growth of the market. For exampleo according to Federal Communications Commission, in 2016, it opened nearly 11 GHz of high frequency spectrum for the use of mobile and fixed broadband applications, 3.85 GHz of licensed spectrum in the 27.5 – 28.35 GHz and 37 – 40 GHz bands, as well 7 GHz of unlicensed spectrum from the 64 – 71 GHz band. This in turn is expected to aid in growth of the market. Analog Devices, Inc. , Cavium, Cisco Systems, Inc., Ericsson, Fujitsu, Huawei Technologies Co., Ltd, Intel Corporation, LG Electronics Inc., MACOM Technology Solutions, MediaTek Inc., NEC Corporation , Qorvo, Qualcomm, Samsung, and VMware, Inc some of the major companies of 5G Infrastructure market. About Coherent Market Insights: Coherent Market Insights is a prominent market research and consulting firm ofering actionready syndicated research reports, custom market analysis, consulting services, and competitive analysis through various recommendations related to emerging market trends, technologies, and potential absolute dollar opportunity.